Taboolicious is creating content you must be 18+ to view. Are you 18 years of age or older? Almastriga is a classic metroidvania game where you play as Jane, a cursed woman at odds against a great evil that wants to use her as a vessel to cross into the world’s dimensional plane and take it over. However, Jane quickly realizes the curse isn’t all bad. Do you have what it takes to help Jane withstand evil’s lure and rid herself of her curse before it’s too late? Right now the game is in pretty heavy alpha and is in no way representative of the final product. We’re currently trying to get together a demo that shows off all aspects of Almastriga while also creating a solid test environment as we refine the combat system, implement new features and design the game’s various enemies. The game does already feature some NSFW scenes by way of the farm, where you can get a glimpse of the static and animated scene quality levels we’re shooting for. New NSFW scenes are constantly being added with subsequent updates too. 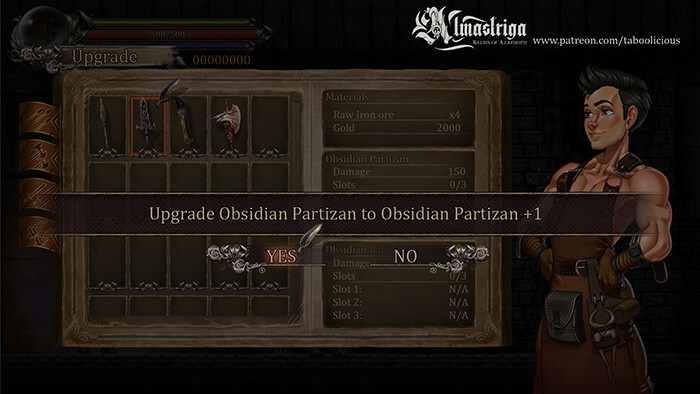 As you progress and level-up in Almastriga there will be 3 distinct combat progression paths for you to choose from. This is pretty self-explanatory. The more you go down the melee path, the stronger your combos become. There will be a variety of different weapons to choose from too, each of which offer their own unique combos and play styles. Which weapon you choose to use ultimately comes down to personal preference, but whatever you choose will be boosted by going down the melee skill path. Again, pretty self-explanatory. 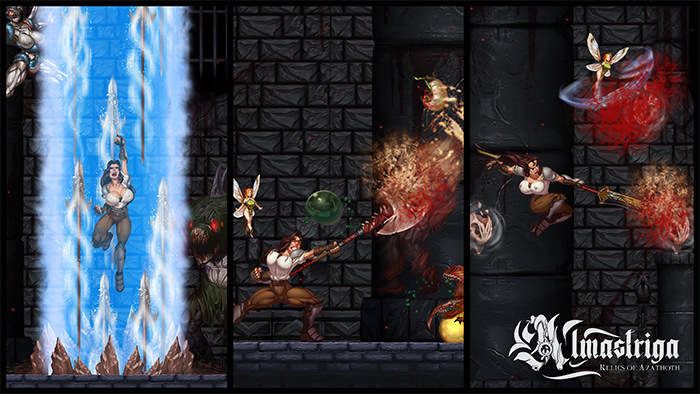 In addition to additional raw combat prowess, Jane’s curse has given her the ability to practice destructive arcane arts. The deeper you go in this combat tree, the more spells you’ll have at your disposal and the more powerful they’ll become. You’ll also have a much easier time casting more spells before running out of mana. Have you ever wanted a fairy companion at your beck and call? Well look no further than this combat route! The further you progress, the more fairies you’ll have at your command and the more helpful they’ll become. You’ll be able to choose from aggressive, support and navigational roles – decking your fairy companion out to assist you in whatever way you may need. As players, we’re not really big fans of pointless one-off NPCs. That’s why we want to make sure every NPC we introduce into the game serves a purpose. There are currently 6 planned NPCs who will each offer Jane special services form which to strengthen herself and ease her fight against the evil forces hellbent on her capture. Each NPC and his/her subsequent service will be unlocked via the questing system. How is the blacksmith supposed to create your next weapon upgrade without a hammer? You’re going to have to go find it – or some reasonable facsimile – or else risk taking on tougher baddies with terrible weaponry. Current planned facilities include the farm, crafting, mining and mercenary work. Access to the development blog: sketches, screen caps, and progress reports. Disclaimer: Delivery will take a bit of time so please have patience. Reaching this goal will allow us to work full time on this project. That means faster and denser updates.